Please Note: Board is already assembled. 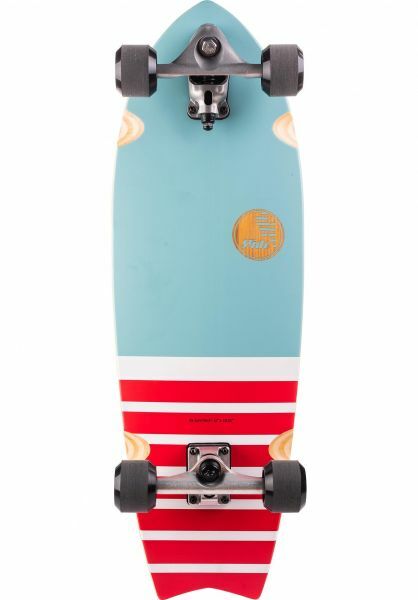 A little bit wider, a little bit longer, the Fish is a comfortable, agile Cruiser Complete from Slide Surfskates! The wide distance between trucks creates a relaxed surf-like feeling, which is a plus for beginners and more advanced surfers and skaters alike. The Fish really enjoys carving and rides smoothly, but it's also more stable during pumping than the other boards in the series. The front truck is a 165mm New Wave and includes the innovative "feather system", giving you a unique wave-riding experience which is absolutely unparalleled in the modern skate scene. A uniquely awesome cruiser! Perfect for all your surfers who want to "train" during off-seasons! Mit der Preis Leistung bin ich sehr zufrieden. Ich habe das Board einwandfrei erhalten. Die Lieferung war sehr rasch. Ein super Board für meinen Sohn (13). Jetzt braucht der Vater auch noch eins.